After a three-year hiatus and following the mix tenures of Tiësto and Richard Durand, Black Hole recordings have retooled the ‘In Search Of Sunrise' DJ dynamic, securing the services of Markus Schulz, Gabriel & Dresden and Andy Moor. Cumulatively this has resulted in an album that draws on the music of many a mainstay - Above & Beyond, Dakota, Cosmic Gate, Solarstone, Ferry Corsten, Paul Oakenfold and Aly & Fila among them, assimilated into much of the DJs’ own interpretations. First to make his pitch is Markus Schulz, who begins his quest with ‘Hymn of the Replicant’ - an exclusive overture born of recent studio sessions with Jam El Mar. From there it cruises onto Above & Beyond & Justine Suissa’s ‘Cold Feet’, lifts again with ‘Something About You’ (his Dakota pairing with Arkham Knights), before marking its median through Solarstone’s homage to ‘Midsummer Nights’. Travelling onwards it also includes the Corsten x Oakie collab ‘A Slice Of Heaven’, before delivering new perspectives (from Johan Gielen and Elevation) on Schulz/Suissa’s ‘Perception’ and Moogwai’s ‘Viola’. Like ISOS itself, Gabriel & Dresden have done their own fair share of rematerialising of late. Josh & Dave transition through the likes of Naden’s ‘Submersion’, the vocalism of Eelke Kleijn’s ‘Home’, elegiac elegance formed by Lucas Rossi’s ‘A Part of Myself’ and Estiva’s ‘Space Dust’. Denoting daybreak, the pair sequence a run of their own material. Their recent G&D reworks of Dirty South’s ‘If It All Stops’ and Above & Beyond’s ‘Is It Love?’ prefaces their most recent single ‘Over Oceans’ and Cosmic Gate’s revision of ‘Only Road’. 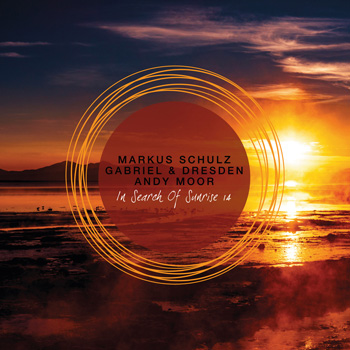 The finals mix debutante for 2018 is Andy Moor, who begins his expedition with Paul Thomas’ chilling of Aly & Fila/Scott Bond/Charlie Walker collab ‘Shadow’. He progresses with Stoneface & Terminal’s take on Thrillseekers’ ‘In These Arms’ and Omnia’s rework of Lange & Sarah Howells’ ‘Out Of The Sky’. Contrasting remixes with new tracks, he includes Airbase’s ‘Vermillion’, ‘Beacon’ from Mike Saint-Jules and Andy’s Becky Jean Williams team-up ‘The Real You’ into its system. He also drops comp-exclusive versions of ‘Proteus’ and ‘Bioluminescence’ from Neptune Project in, before delivering the ‘Broken Wings’ inspired ‘Supernal’ from Supernal.